Houston’s fine weather will continue for the next several days—it’s difficult to believe we’re at the end of August—before some rain chances return. This post will discuss two potential tropical threats (neither of which we’re particularly concerned about at this time) and the increasing likelihood of the region’s first cool front next week. Expect perfectly benign, sunny conditions, with highs of around 90 degrees, lows in the lower 70s, and light winds. The overnight lows are courtesy of drier air moving in on the backside of Harvey as it lifts into the Midwest over the next couple of days. Onshore winds resume by the weekend, and there’s perhaps a slight chance of showers on Sunday, but nothing to be concerned about from a flooding standpoint. According to TxDot and its continually updated map, more roads are opening around Houston as the bayous drain, but plenty of roads remains closed to the southwest and northeast of the city. 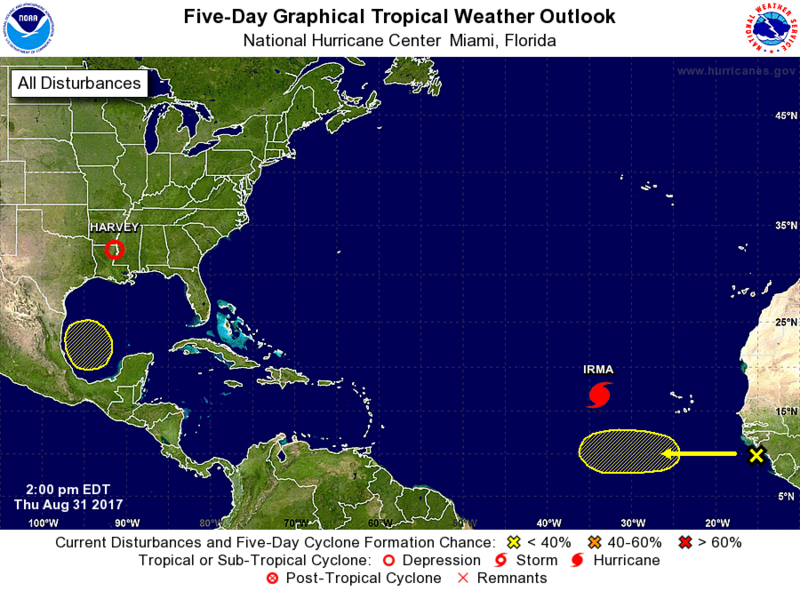 By late this weekend, a low pressure system may move into the southern Gulf of Mexico, and the National Hurricane Center says it has a 20 percent chance of developing into a tropical storm or depression over the next five days. Some people on social media have been expressing concern about this storm, but we remain pretty confident it won’t be a significant threat to the hard-hit Texas coast. It’s worth noting that the GFS model (which had been bringing a lot of rain into Houston next week) has now backed way off. 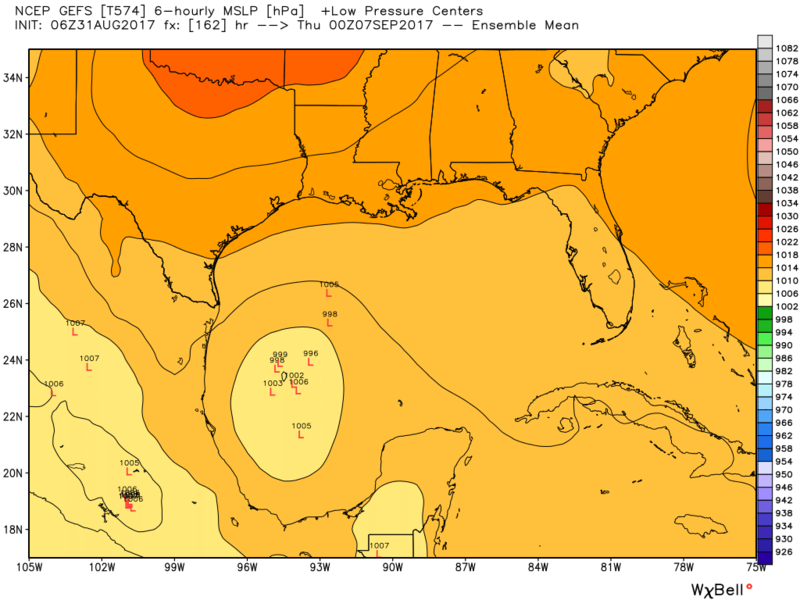 See how far the ensemble run of the model keeps the low pressure system away from Texas. With that said, we do expect the return of some clouds and rain chances next week, beginning on Labor Day and probably running into Wednesday. Right now I’d say we’re looking at anywhere from a few tenths of an inch of rain to about an inch, most likely. If this forecast changes, we’ll of course let you know. Wednesday, 2pm CT—Anyone who walked outside on Tuesday evening—and it sure did feel almost spiritual to see the sun, didn’t it?—surely also felt the comfortable temperatures outside. 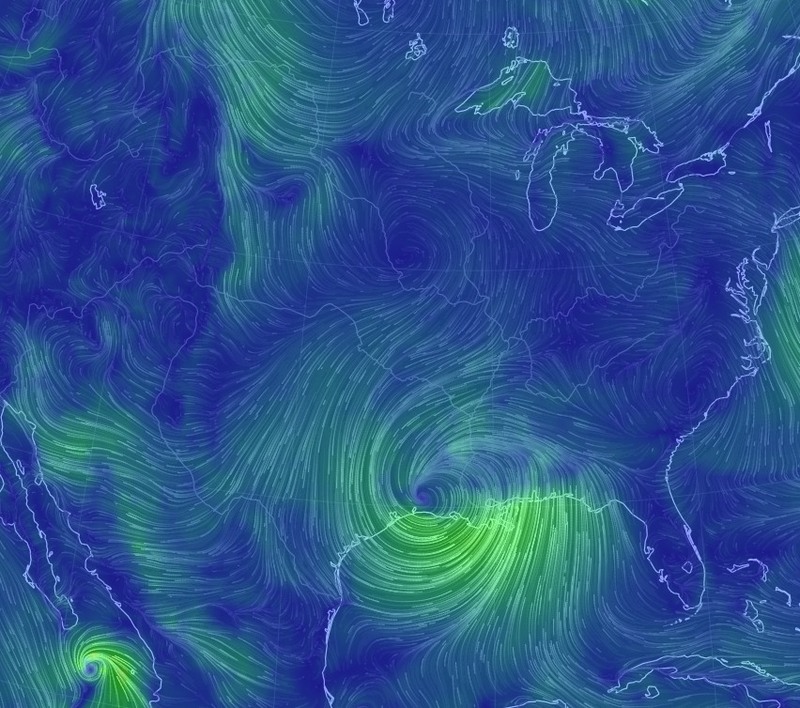 It was, in fact, amazingly cool during the height of Harvey. High temperatures on Sunday (77 degrees), Monday (74) and Tuesday (75) were uncharacteristic to say the least. They were, in fact, record setting. I checked in with Brian Brettschneider (@climatologist49 on Twitter, and a fun follow), and he came up with the following table. 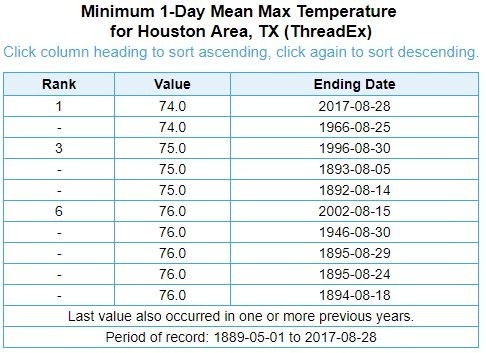 In it, we can see that Monday’s high temperature tied August 25, 1966 as the coolest day in the entire month of August, in Houston, in more than 120 years of records. Tuesday’s high tied for third. Brian believes the 1966 high temperature of 74 degrees was caused by an early cold front, with lower dewpoints, cloud cover, and an overcast day. This Monday’s cooler temperatures were, of course, caused by Harvey, which by that point was drawing northerly winds into Houston, and along with cooler air, this somewhat drier northerly air also allowed for evaporative cooling as the rains fell. This was the only nice thing about Harvey.